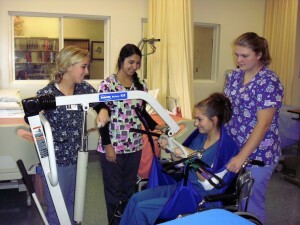 Health Occupations is designed to be a career awareness course with skills learned for diverse medical jobs. Units of instruction include health career search, health and disease, anatomy and physiology, medical terminology, human growth and development, communication, health care responsibilities, and job seeking skills. Students wishing to obtain state certification as a nurse assistant (CNA) may do so through this program. This program also offers certification in Basic Life Support including Automated External Defibrillator (AED) use and First Aid for Healthcare Professionals. Local area health care establishments such as hospitals and nursing homes provide locations for clinical rotations, allowing students to put skills they learn in the classroom into practice in live settings. Outcomes: Competency Certificate, Skill Profile, Certified Nurse Assisting (CNA), Certification in BLS and First Aid for Healthcare Providers, NOCTI certificate, NOTI college credit certificate, and three college credits in Medical Terminology.